“I was charmed, and we became instant friends after the first conversation,” Michelle Obama says. “Eventually I wore her down,” is Barack Obama’s version. Michelle Robinson had no idea that she was about to mentor a coming president of the United States when she was introduced to the hotshot Harvard law student. She was a first-year attorney at the Chicago law firm of Sidley Austin when word spread through the law office that this young man would be working at the firm that summer. Michelle saw a photograph of the new hire and was not impressed. "I thought, OK, he's probably not all that terrific, and he's probably kind of a clown, and then I found out that his name was Barack Obama," Michelle Obama said in a 2004 interview with the Chicago Sun-Times. 'Well, what kind of name is that?'" Michelle asked herself. 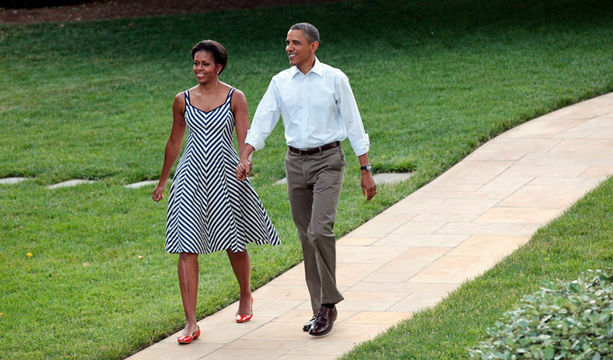 When Barack told Michelle that he wanted to date her, she said no -- repeatedly. She wasn't keen on office dating. Michelle even tried to fix him up with other young women. "Eventually I wore her down," Obama wrote in his 2006 book, The Audacity of Hope. "He swept me off my feet," said Michelle Obama, recalling how her date made her laugh and intrigued her with his "deep understanding" of art. Sitting on a curb, they shared their first kiss over Baskin-Robbins ice cream. "It tasted of chocolate,” Obama writes in his book. Michelle found they shared the same humor, the same values and interests. She admired the fact that he had a worldly charm, and at the same time showed a genuine desire to help the less fortunate. Michelle Obama's brother, Craig Robinson, remembers meeting Barack while he and Michelle were still dating: "I loved the way he talked about his family because it was the way we talked about our family. I was thinking, ‘Nice guy. 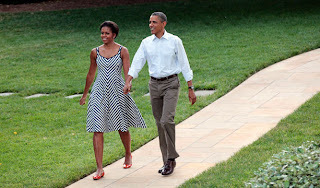 Too bad he won't last.’"Michelle waited two years before Barack finally proposed. She didn’t like the fact that he struggled with whether marriage had become an outdated institution, though she knew he didn’t fear commitment. Over dinner at Chicago's swanky Gordon restaurant, now Naha, the coming president had a peculiar smirk on his face. On the dessert plate was a box with a ring inside. 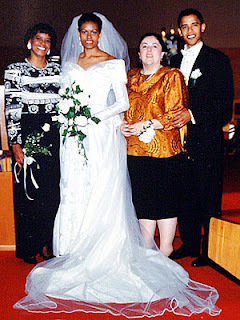 Barack and Michelle were married in October 1992 at Trinity United Church of Christ. Their reception was held at the South Shore Cultural Center, which was once an elite private club off limits to African Americans and Jews. 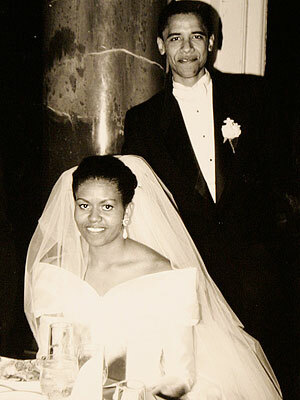 "It was magical," Michelle Obama's close friend Valerie Jarrett, a top campaign adviser, says of the wedding. "They were clearly madly in love with each other."